Bushwacker Pocket Style Flares - Complete Vehicle, Inc. These Bushwacker pocket-style flares are custom-crafted specifically for your ride, ensuring a flawless fit and provide additional coverage for oversized or offset wheels and tires. They’re constructed from Bushwacker’s Dura-Flex 2000, the brand’s proprietary automotive protective material, built to withstand warping and cracking in the extreme heat or cold. The state-of-the-art material is designed for extra flexibility and durability, so you can bet that these fender flares last for the long haul. Bushwacker Pocket-Style Fender Flares are coated in a universal OEM black matte finish that looks great as-is, but are easily customizable and simple to paint match with your ride’s paint code. Best of all, Bushwacker pocket fender flares feature hassle-free installation, with no cutting or drilling required for most vehicles. 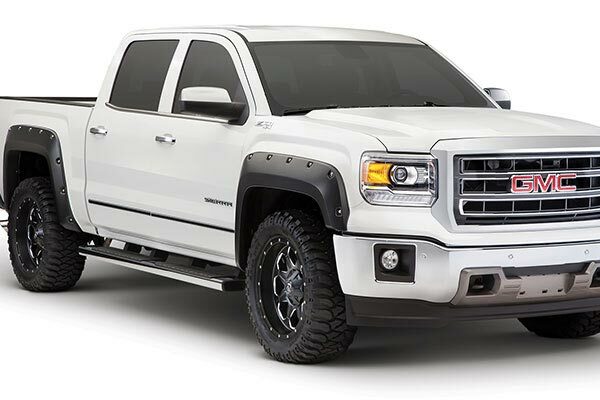 Bushwacker even includes stainless steel hardware for easy installation and backs your Pocket-Style Fender Flares with a Limited Lifetime Warranty.